The research published in the Nature paper is particularly close to my heart. Indeed, such a scientific program was deeply interconnected with another, for me much more important, venture. The scientific endeavour started from the unexpected results obtained by analysing a deep X-ray scan of the Galactic plane towards the Galactic center (Ponti et al. 2015 MNRAS 453 172). In that work, we detailed the distribution of the hot phase of the interstellar medium (plasma with temperatures of about 10 million Kelvin, orders of magnitude hotter than the surface of the Sun and bright in X-rays). As expected, such plasma was primarily concentrated along the plane, where it is gravitationally bound. However, surprisingly we discovered an over-density of hot plasma far above the Galactic plane. Why was such hot plasma located there? This was the question that sparked the beginning of this investigation. Distribution of hot gas at the Milky Way center as available in 2015. The white lines indicate the extent of the well exposed X-ray survey available at that time. An excess of hot plasma, having sharp edges highlighted by the dashed lines, is observed at high (𝑏 ≳ 0.2°) Galactic latitudes (image from Ponti et al. 2015 MNRAS 453 172). Around the same time, another, more personal, project began. I have to admit that, while I deeply love science, the latter was much more exciting to me. It began with Dorothee, my wife, looking into a pregnancy test and looking back at me with a big smile. 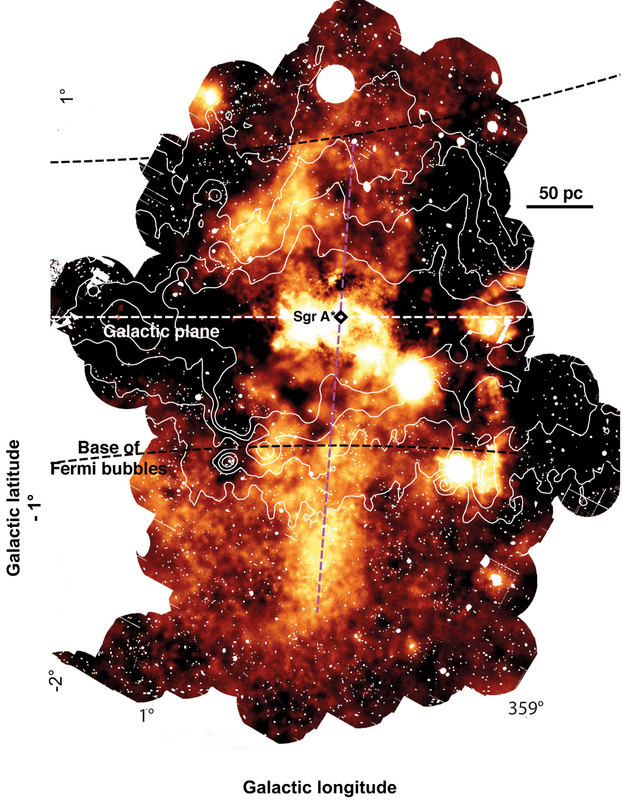 With collaborator Mark, by comparing our X-ray map with pre-existing radio surveys, we realised that the mysterious high-latitude hot plasma showed edges roughly coincident with the base of a radio structure, called the Galactic Center Radio Lobe. Encouraged by Mark, we proposed new X-ray observations to cover the entire extent of the Galactic Center Lobe, located north of the Galactic center. The new XMM-Newton observations were astonishing. Indeed, the hot plasma not only filled most of the Galactic Center Radio Lobe, but it extended even beyond its northern extent. Additionally, the new data opened another, even bigger question. In fact, the physical properties of the hot plasma were suggesting that its strange morphology was the result of an outflow from the Galactic center. This was particularly puzzling. Indeed, such an outflow would be expected to produce symmetric structures north and south of the Galactic center, on both sides of the Galactic plane, while the radio lobe was known to be present only north of the Galactic center. To verify whether the outflow would have a southern counterpart, we proposed an additional X-ray scan. The new XMM-Newton scan (1.5-2.6 keV energy band) covering the full extent of the Galactic Center Radio Lobe (north of the plane) as well as its symmetric region south of the Galactic plane. The white contours indicate the surface brightness in the radio band (10.55 GHz). North of the Galactic plane, intense radio emission is observed at the location of the Galactic Centre Radio Lobe, while its southern radio counterpart appears missing. The new X-ray map reveals that the previously observed excess of X-ray emission (b ~ +0.2° to b ~ +0.5°) is part of a column of outflowing hot plasma, the so-called chimneys (highlighted by the magenta line), located north and south of Sgr A*. The chimneys connect the Galactic center with the base of the Fermi bubbles. Indeed, enhanced X-ray emission is still observed at high latitude (|𝑏| ≳ 1°), corresponding to the X-ray counterparts of the Fermi bubble. Bright X-ray point sources have been removed (image from Ponti et al. 2019 Nature 567 347). I remember this epoch as a phase of truly frenetic work and an extremely worried mindset. This was dictated by the fact that, after an ultrasound, we discovered that a hole was present in the diaphragm of our growing fetus. I knew that soon after birth, my daughter Alice would need all the help that I could give her. And soon after, I realised how futile my knowledge is. We travelled all around to consult the best doctors. Despite this, I felt helpless toward my daughter. This was even more frustrating because I was fully aware of the efforts made by my parents to allow me to study, leaving me the freedom to choose the subject that I wanted. One of the biggest gifts of my life was provided by the Max Planck Society and its directors who provided me with flexible working conditions and a chance to temporarily work from Heidelberg, close to the hospital where my daughter was treated, so that I could be close to Alice during most of her short life. Dorothee and myself are really happy that we had that time together, even if so short. For Alice’s funeral, I tried to dedicate something to her, but I soon realised that I am no poet or singer. I decided that I would do all that I could to dig out the best science from the data and then to dedicate this work to Alice. This helped me to overcome the loss of meaning and without this additional force, I doubt we would have obtained the results shown in the Nature paper. In the meantime, the new data arrived and thanks to Florian, Eugene and Frank, we created the new X-ray maps that led to the discovery of the chimneys extending north and south of the Galactic center, corroborating our suspicion that they are crafted by energetic outflows from the Milky Way center. Additionally, they raised the exciting possibility that the hot plasma within the chimneys is feeding energy into enormous structures (the so called Fermi gamma-ray bubbles) having a size comparable with that of the Milky Way itself. We are persuaded that the discovery of the chimneys, and their connections with Galactic center activity and with the Fermi bubbles, represent an important step forward for our comprehension of the formation, shaping, and feeding of the gas content of various galactic structures such as the Galactic corona and halo. I am glad to dedicate this work to Alice. Thank you for sharing your story, Gabriele. And congratulations on this important work!